Tim Hampson writes: "I cannot think of what is more mysterious – the stories which abound about Welbeck Abbey or the enigmatic, elemental lifecycle of a yeast cell. The Welbeck Estate has a history that goes back at least to the year 1200 when the house that we see today was built and part of the grounds were landscaped. Home to the Portland family, the fifth Duke was as mad as a box of frogs. A mid-19th century coal baron, he was something of a recluse, somewhat akin to the American billionaire Howard Hughes. Under his grounds, he used his miners to dig an extensive and elaborate network of tunnels so he could travel the estate in his horse drawn carriage unseen. The tunnels still exist and are in perfect working order, though all most visitors will see are the glass skylights, which are visible in the road like pools of rainfall on a spring day. The family-owned estate is also home to the School of Artisan Food, which includes a bakery and cheesmakers. Bakers, cheesemakers, and their students tease yeast into life to make the most glorious creations. The breads are so tasty and crunchy that they can be eaten on their own, without the need for butter. A range of organic, handmade cheeses are produced including an unpasteurised Stichelton cheese, made from the organic milk from a herd of Holstein-Friesian cows at Collingthwaite Farm on the estate. All the produce is sold in the farm shop. In June, to the Welbeck Estate’s family of yeast-derived products is added a brewery. Housed in a converted former carriage workshop, it has been developed by one of the country’s best brewers, Dave Wickett (seated), the founder of the Kelham Island Brewery and owner of the legendary Fat Cat pub in Sheffield, with one of his former charges, Claire Monk, as brewster. Here at Welbeck Abbey Brewery can be seen the brewer’s art and craft. Brewers takes such simple natural raw materials – malted barley, hops and water – and with the magic of yeast they turn them into the symphony of tastes and colours that we call beer. 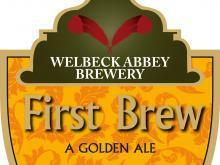 And it may be early days at Welbeck Abbey Brewery, but I’m liking what is emerging. Chair of the British Guild of Beer Writers, Tim Hampson is a well-known beer judge, author and journalist, with his own blog. Appropriately known as beerhero on twitter, his lengthy roster of fine books includes The Beer Book (Dorling Kindersley), and London’s Best Pubs & his most recent one, London’s Riverside Pubs, (both, New Holland).